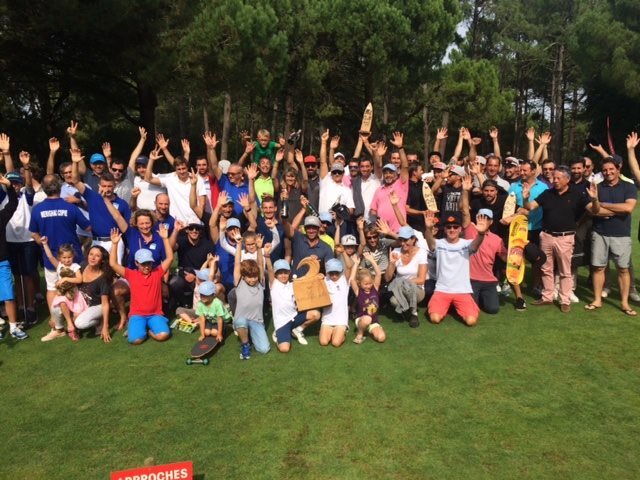 5 good reasons to enter the “Lacanau Surf & Golf Trophy 2018” in September near Bordeaux (France). It’s the 4th edition of this unique amateur contest which unites surf and golf lovers. There is no other contest in the world where golfers and surfers get together for one competition. That’s why this event has gathered great momentum every year and will be running its 4th edition this year. And there are no surprises when the time comes to bring surf and golf pals together in one of the best spots for both sports. Lacanau is a beautiful sea resort on the Atlantic coast less than 1 hour from Bordeaux. With its international reputation as one of the best surfing spots in Europe, this lovely town is equally well known for its International Golf course. You’re a keen golfer but not a surfer or vice-versa? Just find a friend or a member of your family who would like to team up with you for a weekend of fun. Teams of 4 with at least 1 surfer can enter. And with all the activities scheduled during the weekend, free tuitions are organised for golfers keen to learn about surf, in a fun and relaxed atmosphere! Look at Adam Scott, the Australian golfer or Rafael Cabrera-Bello, his Spanish counterpart. 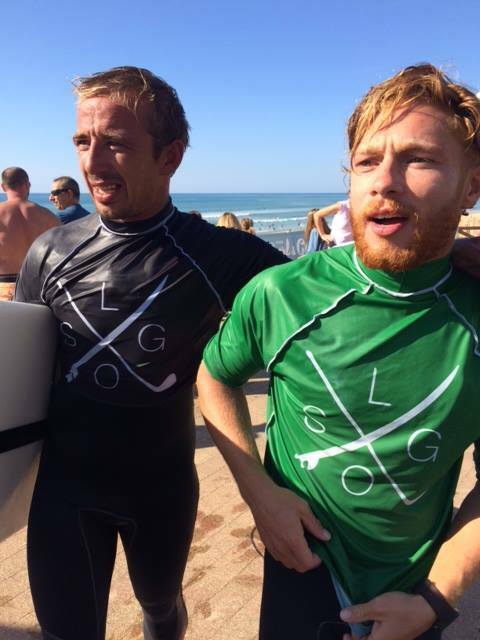 These two great golfers never stay away too long without a surfing outing. What about Kelly Slater, the famous American surfer who has taken golf very seriously. For them, both golf and surf are sports of commitments and great exhilaration. The wow effect is unique and hard to describe in both sports! Reason N°2: extend the summer in South-West France without breaking the bank. Lacanau in South-west France is famous for its sunny weather and beautiful beaches particularly in September, a month well known for Indian summers and beautiful waves. Getting to Bordeaux from the UK couldn’t be easier! There are 9 direct daily flights from London (Gatwick, Stansted, Luton, City), Southampton, Birmingham, Bristol, Edinburgh and Birmingham. Likewise if you are coming from Northern Spain, just take your golf clubs and your surf board and either hop into a car or take a short flight. This is a great excuse for pals to organise a ‘weekend’ of fun without breaking the bank, cost per person from €183: this includes entry to the competition and accommodation with breakfast for 2 nights. Transport and package extensions can also be provided upon request. As friends we know you love bragging about your golfing or surfing skills, now is the time to prove it. These 2 sports attract passionate amateurs who love the sensation and fun of it all. No surprise to see that there is an increase in the number of young surfers taking up golf seriously. Fancy some free drinks with a sea view? Don’t worry, after effort comes comfort, so the organizers have laid on the pints, good food and great wine tasting for contestants. And if you have a couple of extra days to spare, why not extend this competition weekend with a few days in Bordeaux to visit the beautiful city and a few wine-making châteaux. Greens&Grapes, the official travel agency, can arrange a bespoke package for you. Location: Lacanau, 50km (or 1 hour) from Bordeaux airport. Saturday 22 September: Surf competition (Seafront in Lacanau Ocean). 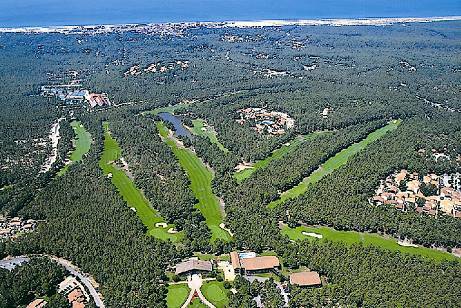 Sunday 23 September: Golf tournament (Golf International de Lacanau).